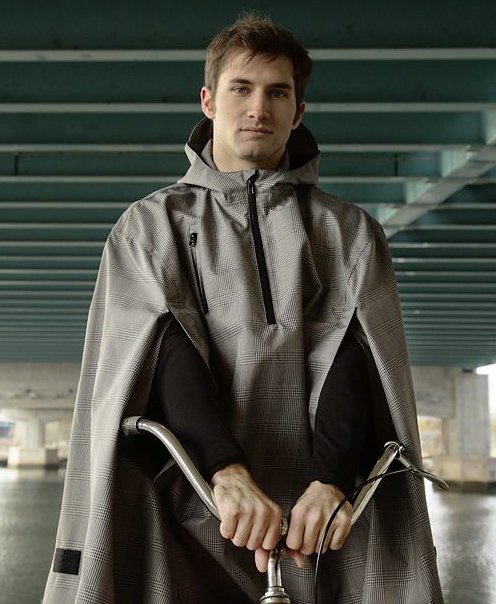 Capes specific to bicycling have a few key features not common in PVC ponchos from Freddie's or Andy & Bax. A cape is a fitted garment, roughly conical, while a poncho is a rectangle with a head-hole in it. 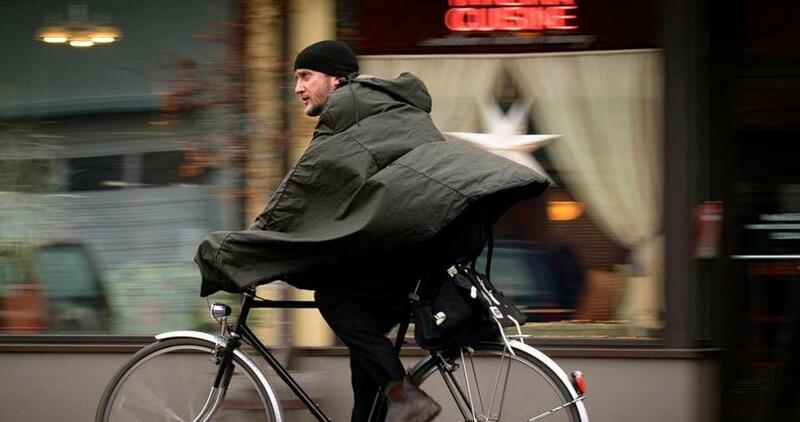 Bicycle capes are long enough in front to drape over the handlebars: this is crucial to protecting your legs. Swept bars call for the longest fronts to reach over the bars. And short enough in back to stay out of your wheel. All have some way to keep the front from flying up or back, dumping rain into your lap: usually loops sewn into the inside fronts to place either your palms or thumbs through, or to loop over some part of the bars. Some have ties to keep the backs from flying up as well. 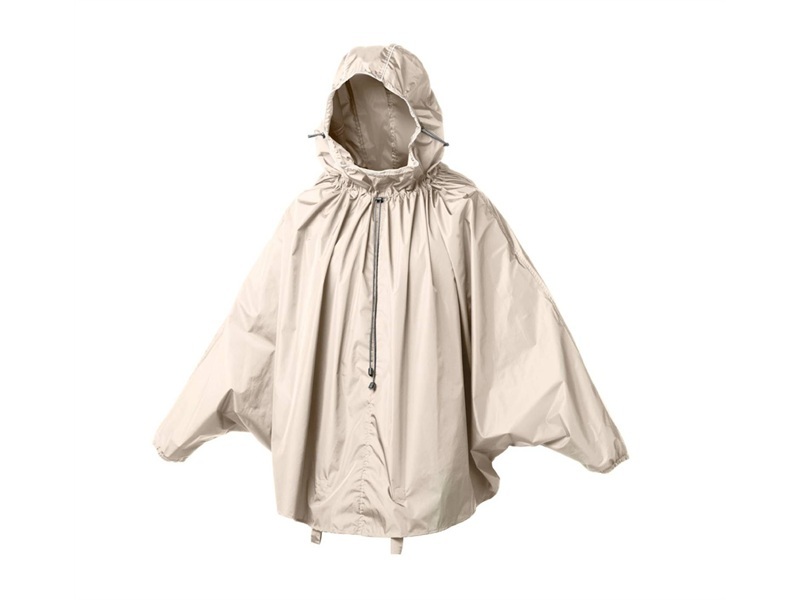 Most have reflectivity or high-vis colors or both, since wet and darkness tend to coincide: a cape puffed up and billowy commands a lot of visual field, especially when reflective. Another issue can be lighting. The most common kinds of bike lights in the US attach to handlebars, which a rain cape covers. To use a cape at night or in Portland's nine darkish wetter months you need lights that mount on your fork crown or lower, like most dynamo setups, or else on your head. We have hardware that lets you mount handlebar-style lights on a fork blade, and usually head/helmet mount types too. This is old school, beautiful in waxed cotton with brass zipper, leather tab, plaid liner at collar and hood. Sewn in Nelson, Lancashire, northwest England, each piece signed. (Thanks Janet for mine!) Aesthetically striking, if Lord of the Rings is a look you can swing. Water rolls off like a duck's back (get it?). Waxed cotton is the original waterproof breathable performance fabric. Where the fabric begins to get wet, the fibers swell to close the gaps in the weave, while dryer parts remain highly vapor permeable. This wettening also makes the fabric somewhat stiff and heavier, helping it lay in place on the bars and around your body in spite of gusts. While the open design of a cape makes the breathable part superfluous, the self-sealing nature of waxed cotton seams makes it perform better than most laminates, notorious for leaky seams. Waxed cotton unlike plastics is also noiseless, and can be re-proofed indefinitely to restore original resilience; our first is 16 years old and still in service with only 1 small rip. Available in 2 sizes, the larger of which is suitable for very tall people on very upright bikes, uniquely so. No relation to Clever Cycles except in sensibility, these timelessly fashionable lightweight rain capes come in lots of fabrics, 3 of which we stock. One's called Electric Houndstooth, as it's got a grid of blazing reflectivity hidden in the plaid, until illumined directly, and POW! Another is Mr Fox Point corduroy, which you might not associate with waterproofness, but this is. Surface moisture evaporates rapidly from corduroy's fuzzy face: all those little fibers sticking up increase the surface area massively. Definitely the most cuddly raingear going. Last is TF Green, which is a quietly dignified Glen plaid with sharp reflective piping. We don't know what TF stands for but it's attractive. All Cleverhood capes feature nifty magnet-closed slits in front, a chest pocket with waterproof zipper, a brimmed hood that doesn't block your peripheral vision, and more. Designed and sewn in Providence, Rhode Island of imported synthetic (PVC-free, very nice) fabrics. We carry both the premium Oxford and the basic Cambridge variants, with the main difference being materials used, resulting in both the most and least expensive of capes we stock. The Oxford is in cotton with a (polyurethane?) coating inside for waterproofness, which looks like a classic waxed garment but without the weight, faint smell and oily feel of proofing wax. This is accented with a 360-degree broad beautiful worsted wool strip, and patch on the back, into which reflective fibers are woven. Then there are the leather straps for rolling it up when not in use: this is a very elegant package. Sewn in England. The basic Cambridge is in honest coated nylon with reflective piping and leather roll-up straps, sewn in Italy. Both Brooks models feature, instead of internal loops to attach to thumbs or hands, gathered cuffs leading to the outside, for your hands. Instead of relying on the internal attachment of your hands to keep the cape from flying up, there are clever magnetic straps that secure the front to the bars. These will break free with any meaningful effort. The benefit is that your hands remain visible outside the cape, say for ease of signaling, and so you can see the controls of your bike. The downside is that your hands need separate waterproof protection when it's cold, while wool liners alone beneath other capes are usually sufficient.